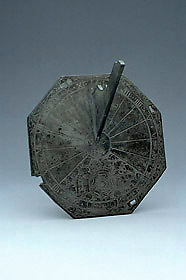 This garden sundial is the earliest known signed and dated English dial. The dial is signed with the initials 'N O' which probably represent the signature of Nicholas Oursian, clockmaker to Henry VIII, Edward VI and Elizabeth I. Oursian was a French Huguenot who settled in England. The dial carries a French inscription proclaiming 'Long Live King Henry the Eighth'.